Sometimes when you visualise the declutter task ahead it is easy to focus just on the sheer size of the task. How much there is to move, the logistics involved in disposing of it responsibly and how on earth you are going to find the time to deal with it. These would have been my thoughts too had the brilliant plan of tackling it slowly but surely not popped into my head on the third of January 2010. Admittedly I wasn’t overrun with clutter but it was there hiding in every storage space in the house. To begin with, in 2007, when we moved into this house it was stacked two packing cartons high four long and three deep in the living room but I’d rather not remember that. And that was after we had already filled all of the available cupboard space. Anyhow, I had no idea how simple this task was really going to be even though I knew my plan was cunning in it’s simplicity. The key to it all is looking at every item in a positive way. To stay positive from the start, begin by decluttering the easy things. Items that have seen better days from being well used, outgrown or no longer suited to your lifestyle. Enjoy there departure by celebrating every square inch you reclaim. As you begin to identify other objects that you are willing to let go of pay attention to your feelings about the object. Perhaps there is some guilt involved in the financial waste this object was. Don’t feel sad just be glad that you are learning from your past mistakes and moving on to a better future. Be grateful for the service that each and every item has performed for you over time even if that was short lived. If these items are still in good condition be glad that they are being sent out into the world to be helpful to someone else. Someone, maybe, who is less fortunate than you who would not be able to acquire the same item new. Rejoice in your ability to now be able to release items you once thought you would be not be able to let go of. Items such as sentimental clutter that you now realise you don’t need to hang on to in order to remember good times and loved one past and present. Enjoy the memories they evoke as you let them go and he happy you are moving on to a bright decluttered future. Be happy in relieving yourself of aspirational clutter. Be grateful you can now let go of the strings that bind you to expectations that are now in the past so you can focus on the activities you really love right here right now. Learn the lesson of not overcatering to hobbies that may not last. In the future only buy what you need when you need it for the activities you enjoy. Approach every piece of clutter with a positive attitude, accept what it has to teach you and then move on to the next. This way you will not only make steady progress on your task but you are equipping yourself with the knowledge and attitude never to allow yourself to get into this situation again. This item was a gift I bought for my husband some time ago after the one his grandma gave him because old and worn out. He came to the conclusion that he really only uses the nail clippers and doesn’t need this whole case of implements. I am glad he didn’t feel he needed to keep it just because I gave it to him. The funny part is the the nail clippers from the set broke soon after receiving it. The rest of it will go to the thrift store this week. Having the right size boxes in the garage to pack up my ebay sale items. Being as my supplies are getting low it was lucky that the ones I did have were perfect for the task. I look forward to the day when I have nothing left to sell. Yes Colleen, i too look forward to the day i have nothing more to sell on Ebay, i have a love/hate relationship with ebay. I posted off 6 items today of my daughters hardly worn at all clothes, i netted £38 and this paid for a pair of much needed school shoes and i was grateful for that. BUT i just hated parceling it all up and don’t get me onto the fees!!! Ebay own paypal, two bites of the cherry anyone!? But posting those items today resonates with your post, i must learn not to overbuy clothes for my daughter. She wears a school uniform monday to friday saturday she is in dancing clothes and sunday is comfy clothes. In reality she only needs 3-4 decent outfits. I WILL learn from this! Good for you Sharron, you gave the correct response to your own comment. Live and learn as they say. When she is in uniforms and dance clothes most of six days she should be able to wear the same casual outfit that she puts on after for a couple of days at least. I have a friend who’s grandchildren have much the same clothes situation to you except they wear the uniform (a clean one each day), put an outfit on after school, then PJ’s at night and everything goes in the wash everyday, including the PJ’s. This lady lives with the extended family and spends most of her spare time washing and ironing. Not to mention the wear and tear on all those clothes getting washed so excessively. The wear and tear is showing on my friend as well. And on the ebay thing, you are so right they are cunning with the fee grabbing that’s for sure. That is the part that annoys me and puts me off using them. There latest trick here is to give you 30 insertion free auctions per month but then they charge a 7.9% ending fee. I am actually happier with that because at least I am only paying fees on things that sell now. I think this is my favourite article so far. Its very beautiful, colleen. I made “decluttering” and rearranging a hobby just this summer, and I cant tell you how much joy I get out of it. Knowing that the decluttered items are now, where they should have been a long time ago, just gives me a huge feeling of satisfaction. Even better when I gave things away to friends or when I donated stuff to good causes. I really think I am getting close to crazy, because I am overrun by consume and adverts, by noise and flashing colours. I want to enjoy space and time, not items and inner pressure. thank you so much for sharing your optimism with this beautiful, diverse and friendly blog, it is playing a significant role in my new hobby and I am very happy that I wont get out of ideas and dreams, because of this. and did I get this right, you started with 24 boxes in your living room?? (4 long and 3 deep times 2?) – I think I should find Day 1 and read your story in one go, that seems really a lot. I am so glad this post spoke to you, that was the whole point of it. Some people feel so bogged down in their clutter that they just can’t see a way out so I wanted them to try to look at it positively instead of just feeling bad about it. I am glad it stirred up the emotions in you and don’t apologize fro that, because even if you are on top of the situation feeling even better about it is always a good thing. The more you feel the benefits of the task as you go along the more enthused you will be to keep at it and never to full for all the consumer hype that got us here in the first place. 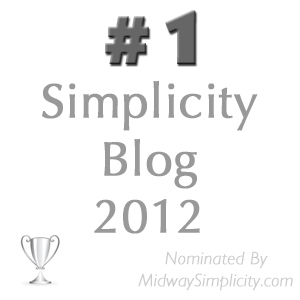 Thank you for joining our little community here, your positive attitude is an asset to my blog and to my other readers. 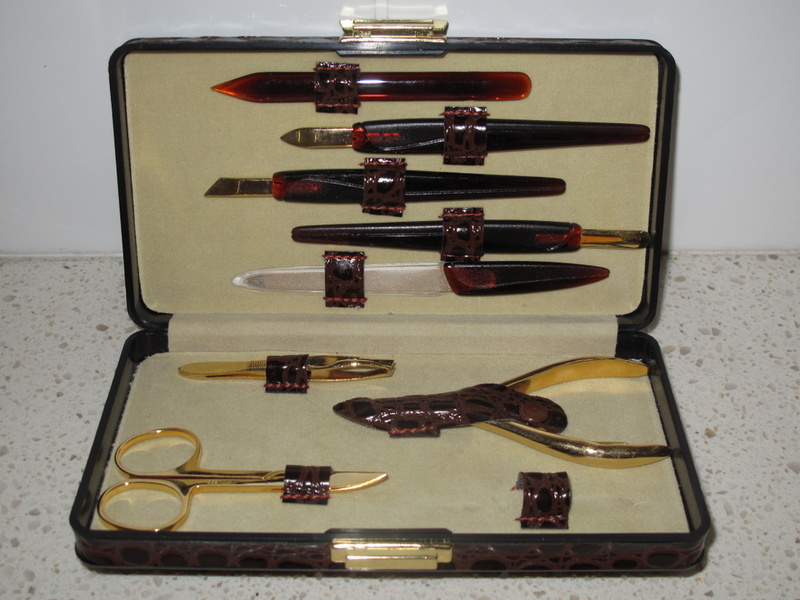 I had a set like that, only it was pink, my Dad had given me as a gift. I never used it either! Got rid of mine years ago & Dad has given up buying his own gifts, which is a relief for us all. hey at least your dad tried, I don’t think my father ever bought a gift for me in my life. Although by the sounds of your experience that is probably a good thing. I had my husband choose and write our daughters birthday card this year. She was surprised and I dare say that will be clutter for years to come. I also leave my husband in charge for all online gift buying duties. This is usually computer or camera stuff that the kids or requested. We let them choose their own gifts and pad them out with cash. They get something they will get good use out of and not a pile of rubbish they don’t need or want. of your experiences & opinions. It is entirely my pleasure Sumarie and I am glad you enjoyed it. This approach is working well in our household. I have been very open with my decluttering but don’t touch my spouse’s stuff. He’s very much of the “I might need it one day” school of thought (a family trait). Today he asked me for a little box for the satellite radio antenna for our trailer and I asked what he’d done with the broken one and he told me he’d put it in the garbage. I asked what he’d done with the malfunctioning GPS cord and he said he’d put that in the garbage too. And he’s now willing to look for a way to dispose of all the fancy silver plate wedding gifts from his first marriage (over 30 years ago). This would not, could not, have happened a few years ago. I think he ‘gets it’ now. Hooray! Well done Wendy, you are slowly but surely converting him. And how is he going with those keys. I still think of him every time I put my bag and phone away. He has been a good influence on me. He will be amused if you tell him that I am sure since it was supposed to be the other way around. By the way, last week he was taking his fishing rods down the basement and wondered if he should give some away to a young person we know. I asked if he was giving up fishing and he replied that he had just accumulated more than he needed over his lifetime and maybe it was time to let some of it go. (and when they picked me up off the floor…..) If I didn’t know better, I’d swear he was reading your blog when I wasn’t looking! After cleaning the freezer today I know that our next task will be dealing with food hoarding issues. Onward!! He really is coming along with the decluttering spirit. I hope those rods are out of there before he gets cold feet and changes his mind. You must have thought you weren’t hearing properly when he said that. Food hoarding isn’t wise, particularly perishables because one long power outage and you could have quite a mess on your hands. Especially if that happened while you were away. A friend of mine went home to her fathers house because she had a celebration to go to in town. Her dad was out of town at the time and had been for a week. When she opened the door to the house she immediately knew there was a problem. The master fuse had tripped in the house and the fridge/freezer had been off for several days. The stench was horrendous and she was left to clean up the mess, the fridge had to be thrown away because they could get the smell out of it. Spoke too soon, dangit. He’s misplaced his truck keys. Musta jinxed him. By the way, there’s a difference between not being able to hear…and not listening!!! And hearing aids won’t fix the latter. Saturday is our GARAGE sale folks!! We just want the stuff to go – most of it is pretty good….some brand new………but we’re in the zone for it to go. I’m not looking forward to the actual day of moving and placing the stuff out and hanging around for the buyers……..but there are a few of us holding down the fort, so we can take a break if it gets too much or too boring. Fingers crossed it is a success! Hi Felicity, I bet you have a whole lot more fun than you think you are going to. I do hope you have a huge success selling. Good luck! I am looking forward to hearing the end result. Cheers Colleen, l hope so! Come Saturday afternoon, if at least half the stuff has gone, l’ll be some what satisfied. will let you know. It took me a while to understand what you were trying to say here. It’s been a long day and I am tired and my feet hurt so I am a little slow. Now that I get it I understand what you mean and I agree. Accepting (and appreciating) that things don’t last forever has been a big part of learning to let go of my clutter. That my children wore a shirt, does not mean it needs to be in our lives forever. That I wanted to make a beaded bracelet at one time, does not mean I am a beader from now until the end. That something brought me joy for a day does not mean I need to house it for thirty years. I can change my mind about things, I can change who I am at the moment, without negating what I enjoyed, or was in the past. Thanks for crystallizing the ‘full’ side of letting go, Colleen! I am glad you pointed that quote out since once again there was a spelling mistake present. I am glad you read stings as strings that it was meant to be. This comment goes to prove that you are well on your way to a permanent decluttered future because you are learning from your clutter and letting go for good. Deciding a bunch of easy obvious stuff needs to go it just a spring clean, knowing that you have been clinging to things that really aren’t necessary to your life is real decluttering. Well done Sabine. Thank you for sharing your positive outlook with us! Christine I lifted that quote from 365grateful.com I thought it was great too. “Approach every piece of clutter with a positive attitude, accept what it has to teach you and then move on to the next.” This was the line that spoke to me. It’s a much better approach than dreading the job or feeling sad about moving out long-owned stuff. That was the idea Jo, getting people to not look it this as a dreaded task but as a path to liberation from the oppressive feeling that clutter gives you. Wow, I am not surprised that you feel happy that is a lot of stuff gone from your home. Good for you. It does feel good doesn’t it. Those are the feelings to cling to when the going gets a little tough, not the negative ones. Hi Colleen. I certainly agree with you. It is important to keep a positive outlook while decluttering – and to celebrate each success during the process. As I was regularly decluttering, it was very gratifying for me to look at my new, empty spaces and instantly see the difference it made in how each room looked overall. It was definitely what kept me going. you are showing up as a new commentor although I thought you had been here before but it just might be that I followed a pingback to your blog. It you are new let me say welcome to 365lessthings and thank you for both your link to my blog and for dropping by to leave a comment. It is nice to go back and admire the spaces we create during the declutter process. That action certainly inspires me to keep at it. Yesterday I pulled the Christmas decoration boxes down from the garage shelves and put them in the living room to work on. Seeing all that space on the shelves as I drove out in the car later on made me keen to minimise the decorations further thats for sure. I know what you mean about Christmas decorations. Each year I try to whittle down the amount of decorations that I have. Last year I made good progress by getting it down to two containers of decorations. This year, my goal is to get it down to one (plus the tree). I would love to make this goal happen. I guess we’ll see. I’ll let you know how I make out after the holidays. Take care – and thanks again for your message. Just remember Jennifer, decluttering is a personal thing. Only whittle down to a point where you are happy. As pointed out in Becky’s comment today. Decluttering isn’t a competition for who can end up with the least amount of stuff. Absolutely, Colleen. Decluttering is a personal choice. Each one of us chooses how we want to live (such as being a minimalist), and to what extent we want to minimize our life and possessions down to. For me, I look at how I live and what my usage is of the possessions that I own. I base my decluttering goals on these factors. I also pace my decluttering so that it suits and meets my needs and purposes. Last year, I moved to a new home. Many of the Christmas decorations that I had no longer were necessary to keep. So I decluttered once again. What I have left, I realize now is still probably more than what I actually will use. I would like to declutter them because they are not serving my purposes any longer. I would like to donate them to someone that could make use of them. I am very satisfied so far with the progress that I have made both in decluttering and downsizing. I am looking forward to continuing and progressing in my journey of the minimalist lifestyle. And I wish you all of the best in your decluttering and minimalist living pursuits as well. That sounds perfect and just as it should be Jennifer. That is exactly my approach I think I need to write about this more often so I feel a post coming on. The coming week at 365lessthings is going to be all about pre holiday decluttering. One of the posts is of my decorating effort and declutter this year in which I have greatly reduced what I have in the way of decorations. So stay tuned.